As editor in chief of a science magazine for six years, I’m not sure how I missed the gene therapy revolution. Yes, we did the odd news report on gene therapy, but mostly we were blinded by the deluge of CRISPR publications – a cheap, precise new technique of gene editing that was transforming the ability to genetically modify plants, insects, animals and maybe one day humans. As it turns out this happened in China last November .But it wasn’t just me who missed the gene therapy revolution. It seems most people I speak to about it – including many medical people – hadn’t noticed. The most dramatic example has biblical dimensions. In 2017, the New England Journal of Medicine published the results of a gene therapy trial for children born with Spinal Muscular Atrophy (SMA). These kids normally develop paralysis and die by the age of two. Instead most were sitting and rolling; some were walking and talking. Is this just a fringe thing? Big Pharma doesn’t think so. Novartis recently paid $US 8.7 billion to purchase – AveXis, the start-up company behind the SMA trial. 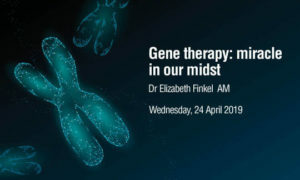 In this talk, allow me to guide you through the gene therapy revolution and how it is set to disrupt the way medicine is delivered. The Victorian Inspiring Australia program is a community-focused initiative led by the Royal Society of Victoria, in partnership with the Commonwealth Government and the State Government of Victoria.